Pontus Jansson’s hero status at Leeds United was further enhanced as a goal made in Sweden earned the Whites three points from their home game with Norwich City. Centre-back Jansson went forward to send a glancing header into the net in the 40th minute from Pawel Cibicki’s well flighted free-kick and it proved the only goal of a well contested Sky Bet Championship game. How it stayed 1-0 in an exciting second half was hard to credit with both sides hitting the woodwork and creating several opportunities, but the three points were a big help to United as they closed to within a point of the play-off places. They started with basically the team that finished the previous one at QPR with Kemar Roofe in a lone frontman role and Cibicki in for his first start at Elland Road. Neither enjoyed the same success they did at Loftus Road, but Cibicki did show promise in his ability to cross the ball from wide out on the right. Kalvin Phillips was first to get a shot in on six minutes only for his effort from 25 yards to curl wide. A fine move down the right followed with Cibicki, Phillips and Luke Ayling involved, but the latter’s low cross was cut out by a defender with eager attackers waiting in the box. Alex Pritchard managed Norwich’s first shot on 16 minutes, his curling effort from the corner of the box being comfortably saved by Felix Wiedwald. Ivo Pinto drove forward impressively from right-back for the visitors only for his cross-shot to drift wide. 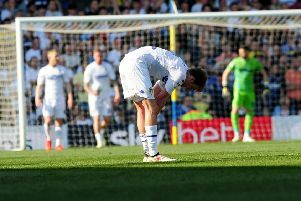 Leeds responded in kind, Gaetano Berardi going close with a 30-yard strike. The other full-back, Ayling, could only send a header straight to keeper Angus Gunn, after meeting Cibicki’s free-kick. The first half lacked goalmouth action in general and it was summed up when Ronaldo Vieira brilliantly intercepted a stray Norwich pass and drove forward into space on the edge of the box only to then overhit his pass for Roofe instead of shooting. Leeds upped the pressure towards the end of the half, though, and from a free-kick by Ezgjan Alioski the ball fell for Phillips, whose shot hit the post. It came out to Cibicki, but he saw his shot blocked. A minute later Cibicki sent over a free-kick from the right and the ball ended in the net this time as Jansson’s smart header from a fair way out went in off the post. Norwich came close to levelling right on half-time when Nelson Oliveira’s curling shot was tipped away by Wiedwald and the rebound was blasted over by James Maddison with the goal gaping in front of him. It was the visitors first into attack after the break as Pritchard’s shot was saved by Wiedwald and Harrison Reed’s follow up from outside the box drifted just over. Maddison then saw a shot deflected straight to Wiedwald following a strong run down the right by Pinto. United survived the pressure and on the hour put a decent attack together that ended with Roofe’s shot from the edge of the box being blocked. Samuel Saiz worked the Norwich keeper with a decent strike from the edge of the box and a minute later Phillips was inches away with a well struck shot from distance. With the action coming thick and fast now Leeds wasted a great chance when Cibicki’s chase down of the Norwich keeper resulted in a panicky clearance, but with four against three and options galore for Roofe he chose to tee up a volley from the edge of box and sent the ball into the Kop. Pritchard went mighty close at the other end two minutes later, his chip hitting the top of the crossbar. Pritchard again went close with another chip from the edge of the box as Wiedwald saved. It was the Whites’ turn to hit the woodwork on 80 minutes when Saiz latched onto a poor back pass by Pinto and only had keeper Gunn to beat, but his shot agonisingly came back off the post with no-one there to follow-up, striker Roofe having just recently been taken off. Marley Watkins came within a whisker of an equaliser with a low shot that almost sneaked in at the far post, but Leeds went into survival mode for the remainder and saw out seven minutes of added time well enough. The only sniff of a late leveller came when Oliveira struck a shot well over from 20 yards while it was United who could have scored again in the last minute when a good move between Alioski and Hernandez resulted in the latter beating Gunn only to see the ball go just wide. Thomas Christiansen was understandably delighted with the three points. He said: “I am very pleased with the performance and the three points. It was a victory to give us more confidence that this is where we belong, close to the top six. “The players are believing in the possibilities we have within the squad. “We made a decent game and were the team that deserved the three points. I am very happy with all the players. “We have seen a lot of improvement with set pieces, but it is confidence as well. In this football the set pieces are very important. We could have score goals as well as the one that Pontus scored. On goalkeeper Wiedwald, who came up with several saves in the game, he added: “Felix improved a lot and also showed his character because after the mistake he made at QPR he saved the team and today he made many great saves. Leeds: Wiedwald, Ayling, Jansson, Cooper, Berardi, Phillips, Vieira, Cibicki (Pennington 84), Saiz (Grot 81), Alioski, Roofe (Hernandez 78). Norwich: Gunn, Pinto, Hanley, Klose, Stiepermann (Hoolahan 83), Reed, Vranic (Jerome 83), Pritchard, Maddison, Watkins, Oliveira.